The spring heat wave has nothing on the red-hot Arts District in Downtown L.A., which recently saw the opening of Fifty Seven, the latest project from Cardiff Giant, the hospitality group that also owns DBA, The Churchill and The Hudson. Located around the corner from Bestia and housed in the former Heinz 57 loading dock, Fifty Seven features a unique concept that centers on a chef-in-residence, who helms the kitchen for a season before handing off to the next chef. The opening chef is David Nayfeld, who garnered widespread acclaim as the sous chef at New York’s Eleven Madison Park, which earned three Michelin stars during his tenure. Nayfeld’s menu, described as Progressive American on the Fifty Seven website, features a selection of shared plates, as well as starters, mains and desserts that are available as a prix fixe dinner for $48. The menu changes daily, with specials and rotating favorites based on farmer’s market finds and seasonal offerings. The Fifty Seven space was designed by Studio MAI, (Hinoki & the Bird, Pedalers Fork, Gjelina). 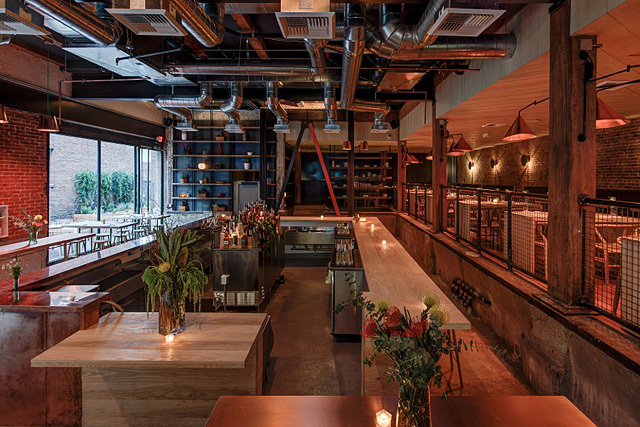 The mix of organic and industrial materials includes blond-pine tables and chairs, exposed ductwork, brick, concrete floors, and a copper-sheathed central bar. Downstairs, a performance space showcases live music on Wednesday through Sunday night. The subterranean lounge’s full bar and no-cover policy add to Fifty Seven’s appeal as a destination restaurant. A recent media dinner began with cocktails, created by Jeronimo Medina. 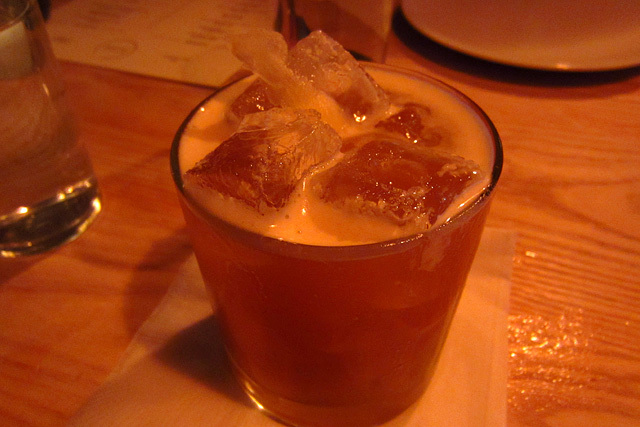 The former Las Perlas bartender worked closely with Nayfeld – reportedly a cocktail aficionado – on the Fifty Seven drink menu. The El Sanguinello is made with jalapeño-infused Pierde Almas Mezcal, Averna Amaro, agave, blood orange, lemon, and Sal de Gusano. 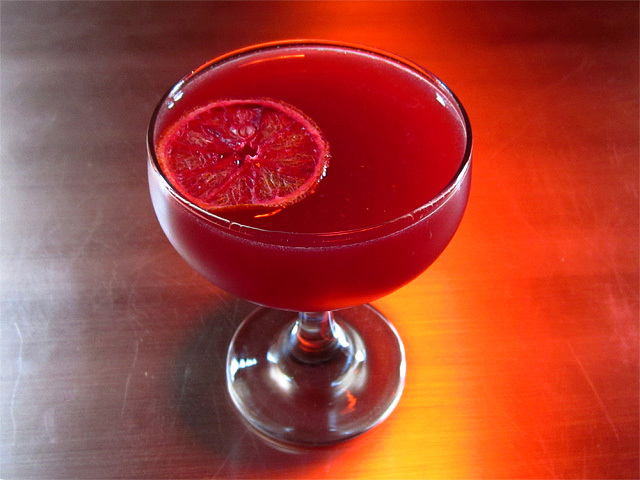 The cocktail’s brilliant hue hints at its spicy, smoky profile, while the Oaxacan salt tempers the acidity. The first sip offered a promising introduction to Fifty Seven. The Contraband seemed to be the consensus favorite, made with Old Grand-Dad Bourbon, Amontillado Contrabandista, Averna Amaro, ginger, lemon, pecan bitters. As guests ascended several stairs to their tables, they could look into the open kitchen and catch a glimpse of Nayfeld and his team, which includes 15-year-old Flynn McGarry. An amuse of gougères – warm, light and airy cheese puffs – were sent out as the group scanned the menus. Rather than ordering individually, we put ourselves in Nayfeld’s hands. He started us with several shared plates, including octopus – seared with a pistachio crust, served with bouillabaisse and smoked potatoes – fantastic diver scallops, and the Pickled Garden, a colorful, beautifully presented plate of cucumber, carrot, squash, cauliflower, baby beets and red miso. The veal liver is a standout shared plate, served with onion jam and Nebbiolo sweet and sour. The liver’s mousse-like texture is rich and smooth – several diners commented on its similarity to foie gras. The La Tur is another winner – the aerated Italian cheese is served with simply dressed radicchio leaves and slices of market apples. Starters include the gorgeous Vegetables À La Grecque: asparagus, cauliflower, and hen-of-the-woods. Each of the mains had their fans, especially the Marin Sun Farms Heritage Pork with spätzle, mustard, beet and apple. Nayfeld also featured a special that night, a superb lamb loin served with a black garlic purée and baby bok choy. As Nayfeld told the Los Angeles Downtown News, “A beautiful pork chop with spaetzle and beets is not rocket science,” a nod to the traditional cooking that anchors his sophisticated yet approachable cuisine. The desserts were uniformly excellent and provided the ideal coda after the onslaught of apps and mains. 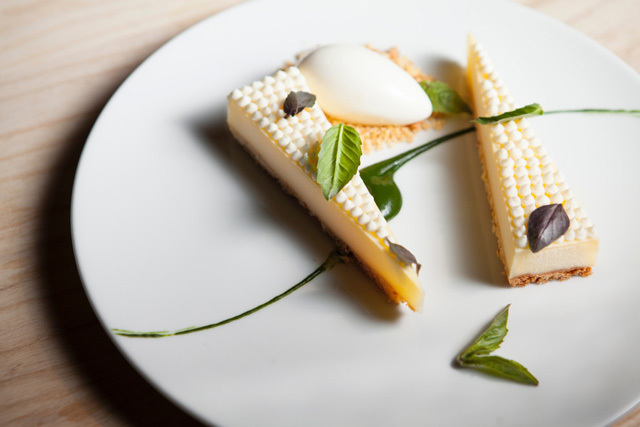 The meyer lemon cake is particularly memorable and perfect for the warm weather – it’s served with ricotta sorbet, crumbled parmesan sablé, and basil sauce. 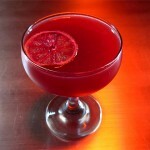 On a subsequent visit to Fifty Seven, I was joined by mi hermano en cócteles, Dave Stolte of Home Bar Basics. I started with the Rusty Beam: El Jimador Anejo, Pierde Almas Mezcal, cinnamon tincture, chocolate chili and orange bitters. 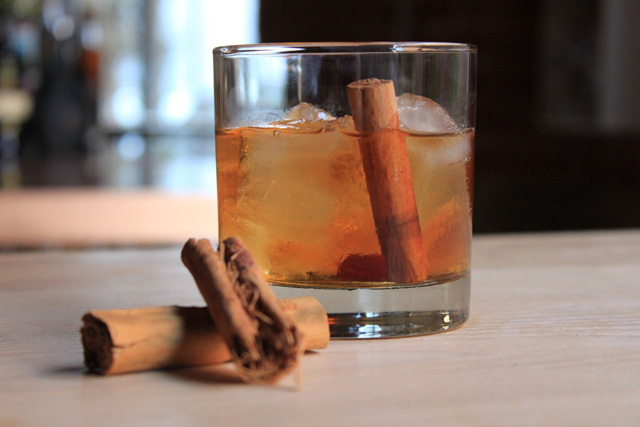 Fans of the sweeter side of the cocktail spectrum should seek out the Rusty Beam, which probably works best as an after-dinner drink. Medina has gradually expanded the cocktail menu from the opening list of six drinks. The Brothers Chartreuse is a recent addition, made with Cachaça 51, Green Chartreuse, marjoram and lime. Stolte opted for the Heritage Pork for his main, while I chose the Amish Chicken, served with artichoke, potato and romesco. The Muscovy Duck for Two looks spectacular, here’s hoping it will be on the menu for the duration – or at least until yours truly can make a return trip with a friend. Every restaurant opening has its challenges, but the Fifty Seven concept puts a unique pressure on the chef-in-residence and the kitchen crew. The chef’s stint is measured in months instead of years – the clock is ticking and the kitchen has to be on point from the get-go. Nayfeld and his team have risen to the challenge, and with his residency expected to end some time in July-August 2014, there’s no time like the present to visit Fifty Seven. 712 S. Santa Fe Ave.